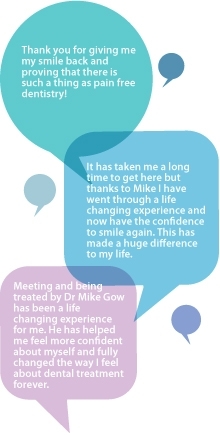 The following success stories and testimonials have been written by the real people who have been where you are now, but have managed to overcome their fear with the help of Dr Mike Gow and team at The Berkeley Clinic. Read what they have to say. Contact The Berkeley Clinic on 0141 564 1900 and you could be writing your very own success story soon! As a dentist of 45 years standing I believe that I am well able to judge that you and the practice have many outstanding features which have enabled me to successfully complete treatment after a life time of problems relating to gag reflex. I have never been frightened by dental treatment per se, but over the years my gag reflex has become more pronounced and as a result dental attendance became overlaid by anxiety regarding the reflex leading to panic attacks. Treatment has always had to be carried out in short bursts around the reflex and involving short cuts such as Stainless Steel Crowns. But for several years I have been unable to have any treatment carried out due to the severity of the gag reflex and the associated anxiety. However following referral to you at the Berkeley Clinic, and following some introductory hypnosis sessions, I have finally been able to have treatment carried out successfully without the need for short cuts etc. This is, I believe, due to the wide combinations of therapy and cutting edge treatment options which you offer. A combination of hypnosis, acupuncture and sedation has enabled me to have successful treatment aided by the use of state of the art treatment methods such as Cerec which actually simplified the process of my treatment. I had not been to the dentist in over eighteen years due to a bad experience when younger. Over the past two or three years I knew I should visit the dentist as I had suffered some tooth ache, but I suffer from anxiety and panic attacks and just couldn’t face it and kept putting it off. I had watched a television program featuring Mike Gow and thought it was great that there was someone that understood and had the time and skills to work with people that have such a great fear and suffer these kind of reactions. After I lost part of a tooth while eating, I finally made an appointment. At my first visit I was in tears but Mike re-assured me that it was fine to cry, and that lots of people did. He had plenty of tissues at hand. It was my choice if I wanted to sit in the dentist chair, after a discussion on my fears and problems I had with my teeth I decided that I would. Mike made sure everything went at my pace and talked through everything he would do. It was decided I would probably need three cerec inlays in my back teeth and a new white filling at front to help improve the cosmetic look. After my visit I felt a lot more confident about going back although still slightly nervous about the injections. It was great how much time was spent with me, the fact I never felt rushed and that it was all about making sure I was comfortable with things. On my second visit I was much more confident. The plan was to do one cerec inlay and possibly the front filling. Once again everything was taken at my pace and well explained. When it came to the injection, I can honestly say that I didn’t feel it at all! It was un-believable! I had one tooth scanned and the cerec inlay fitted. It was then discussed that it was possible to do the opposite side at same time, which I happily went ahead with. In fact, I ended up getting all my work done in one visit! This included three cerec inlays, one filling, (four injections!) and scale and polish. I can say that proudly and with a smile on my face. If I had never heard about the work Mike Gow does, I would probably still have a painful mouth and chipped tooth. The work he does is so important and it's so great to have someone who understand and can work with and round your condition. My teeth are great now and I have had no problems with them since the treatment. I am looking forward to my six month check up which I feel proud to be able to go to now! I could not be happier with what you did with my teeth. I know these are just ‘temporary fillings’ until I get my crowns done, however- the work you did gave me the confidence to smile at and enjoy my wedding day! I would like to thank you and your lovely team for a brilliant job- I can’t believe it only took one visit. You put me at ease straight away and did a wonderful job and made my wedding day everything I hoped it would be and since over 3000 photos were taken I could smile all day something I could not imagine doing a couple of months ago. I would recommend you and your team at The Berkeley Clinic to anyone and everyone. Keep up the good work you and your team are doing. I’m forever in your debt. Many, many, many thanks you all. I am delighted to tell the world of your fantastic work you and your team do. Please use this testimony and my photographs if they will help anyone else. Ever since childhood I have had a severe gag reflex which has made dental treatment almost impossible so for many years I avoided going to the dentist at all. However earlier this year one of my teeth broke and I realised I needed to get treatment for it. I knew I had to find a dentist who would be happy treating someone with a gagging problem I looked on the internet for a suitable dentist in Glasgow and came across the Berkeley Clinic. The facilities and standard of the clinic were impressive. The clinic could provide several sedation techniques and one member of the team, Mike Gow, has a special interest in hypnosis and dental phobia. I went along, Mike gave me an examination and over several sessions the tooth was repaired. Mike used several techniques in combination, hypnosis, gas, acupuncture, which although didn’t eliminate the gagging altogether, kept it well under control. I never had the feeling that I was being given a standard procedure, I was given a treatment plan designed to deal with my specific problems. I also appreciated the way Mike made me feel less like a patient being told what to do and more like a partner in the process and I felt like I was in control of things at all times. Plenty of time was allocated for the treatment and there was never any sense of being rushed. All in all, Mike and the team at the clinic gave me a very positive experience and although I was nervous at first I soon felt very comfortable about going along. The tooth has been repaired and I know that there are no other dental problems that need to be dealt with which has eased my anxiety considerably. If any problems do come up in future I know I will be quite relaxed about going back for more treatment. As a young child I had a number of bad experiences with dentists that unfortunately became exaggerated and distorted over time to the point where I developed a mild phobia. As such I would only visit dentists when absolutely necessary and even then, whilst under some form of sedation during procedures. So after avoiding dental visits for over eight years, a problem tooth finally crumbled and I was forced to face my fear. Asking a friend for advice on where to go, he immediately recommended the Berkeley Clinic. Upon opening the website, I noticed the section relating to the Dental Anxiety Clinic and after reading the testimonials, decided to book an appointment. Shortly thereafter, I met with Dr Mike Gow and talked through my experiences and concerns. After a short discussion, it became clear to me that my fears stemmed from a feeling of powerlessness compounded by a lack of understanding about the whole dental work process. Mike talked me through how he worked and walked me step by step through the dental tools he used. Mike also discussed the techniques he used to limit discomfort for his clients and made it clear that if I felt at all anxious or upset during any of the procedures, I could stop him at any time. 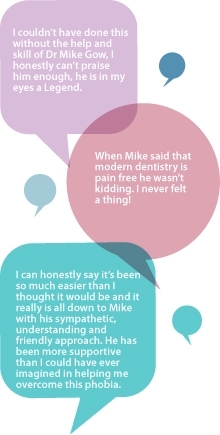 When it came to the actual procedures, Mike was patient, understanding and ensured that my comfort was second only to the quality of the dental work he was performing. In the end I had a number of restorations including inlays and the results are absolutely amazing. I would thoroughly recommend anyone with concerns simply take the time to talk them through with Mike. You may be surprised at how quickly you begin to overcome your fears. I should also mention that whilst I was there, Mike did not work alone. He was supported by a fantastic dental assistant named Ashley who was extremely professional, always helpful and very skilled in assisting Mike putting this particular patient at ease. They made a great team and made my visits there enjoyable, which is something I never thought I would say about a trip to the dentist! Thank you for helping me learn to deal with my fear of dentists. A couple of bad experiences with my dentist when I was younger made me completely terrified even at the thought of visiting a dentist. Giving birth to my first son gave me the motivation to do something about my fear because I didn’t want to pass it onto him. I searched online about dental phobias and found your website and I was delighted to discover that your practice was local. My husband drove me down there and then to make an appointment before I could change my mind. Even walking into reception to make an appointment brought on a panic attack!!! When I came in for my first check up with you I tried to tell you through the tears and hyperventilation that I was terrified at just being there. You didn’t treat me like I was silly but accepted that I had a problem and you would do your best to help me. You calmed me down, explained everything you were going to do and let me see and hold the instruments. When I left I felt a bit better and was at least happy I’d taken that first step. Since that first visit, my confidence in coming to you has improved massively. Just knowing that you are understanding and experienced in coping with people like me is a help, and knowing that I have the option of using gas to keep me calm also helps. You, personally, are a big help too. If I do start to panic you are able to talk me through it and by explaining everything to me you take away the fear of the unknown. Every visit gets a little bit easier. I think it will probably be a while before I am calm enough to have treatment done without sedation but I have come a long way in the last couple of years. Thanks to you I have reached my main goal to get over my fear enough not to pass it on to my children. I am now calm when I come in for a visit, even when I’m coming in for treatment. Not bad for someone that couldn’t even make an appointment for a check up without hysterics two years ago. Thank you for your continuing help and encouragement, not to mention the mouthful of lovely teeth that I plan to keep for the rest of my life. Mike, please post on your website or forward to other people that are in the same position I was in. I just hope it helps others. This is my success story! I have been scared of the dentist for 15 years. My teeth were a mess and were causing me pain more and more. It got to the point I had to do something about it. I spent about a year looking at websites and looking for a dentist in my area. then said we need to get impressions done for your plates so I arranged to go back the following Wednesday to have them done. Between the Tuesday and the Wednesday I got another abscess - some people have no luck! I called Mike who sent a course of antibiotics to deal with it. I arrived on the Wednesday and the impressions were taken no problem. I then arranged when I was to go and get it done - we arranged a week on Friday (the 10th of November). When I say it was a quick week and a half I am not kidding! The 5 days before it was not much fun worrying about getting it done and not much sleep! But then it was d-day. If I had known it would have been this easy i would have done it sooner. I have had no pain at all. Yes, a little discomfort with the plates - but that’s all and it feels great to have a smile again. I can’t walk by a mirror without looking at my new teeth! My friend also told me the minute we got out the surgery I demanded he take me to McDonalds so I could have a milkshake. I cant remember that but he assures me that he paid for his own! It is now 2 days after it was done and I feel great! The whole experience was so easy and pain free. I really want to thank Mike and his assistants for all the help they have given me. Without them I would still be in pain and worrying myself sick. His approach attitude and ability to put people at ease is amazing and his work as a dentist is by far the best dental experience I have ever had. I will be recommending him to anyone who asks, in fact my friend is going next week after watching him work on my teeth and he can’t wait. It’s so good to think there are people in this world who have the time patience and ability to help others over come there fears. Thank you mike for giving me my smile back and proving that there is such a thing as pain free dentistry! Until recently I hadn’t received any proper dental care for over 23 years. The only exception to this was getting a filling ten years ago, however the experience I had on that visit was bad and only amplified my dental phobia. My dental phobia started when I was young and followed me into adult life. Some of the issues I had with the dentist were the feeling of being trapped in the dentist chair without having any control over what was happening to me. I hated having any sort of metal instrument in my mouth, hated the noise and smell of getting my teeth drilled but worse of all I found getting fillings to be very painful. When I was young I had a filling in put my front teeth, the filling discoloured two years after being done. For the last twenty- two years I have very rarely smiled through embarrassment. This affected my confidence as a teenager and adult. I went back to the dentist ten years ago as I was in need of urgent treatment. I only attended the one session as I found the treatment too painful. During the session I received inadequate anaesthesia and an unsympathetic dentist ignoring my plea for more pain relief. I came away from the session mentally scarred and vowed never to go back to a dentist. My perception of the dental industry was of a painful barbaric profession. As an adult I have always tried to ensure that my oral hygiene was as good as possible as I wanted to avoid a trip to the dentist at all cost. I didn’t have any major problems with my teeth until eight years ago when I had a tooth filling fall out. Because I didn’t get the tooth refilled it eventually got infected. For the last few years I was getting bouts of toothache every couple of months. I was treating the toothache with herbal remedies and Ibuprofen. Gradually the toothache got worse and was re-occurring every couple of weeks. Some of the toothache infections turned into abscesses that made my face swell up so bad that I was embarrassed to leave my house. For the last few years my teeth have been a constant worry and led to myself having bouts of depression. I knew that eventually I would have to get some treatment, however my phobia was so bad that even the thought of sitting in a dentist chair made me feel very anxious and nauseous. I couldn’t even look through lists of dentists in yellow pages without feeling unwell. I eventually came across Mike’s website “Whatfear.com”, whilst browsing through web pages on dental phobia. I read through a lot of the testimonials on the site and was glad to know that there were a lot of other people out there that had suffered from this phobia, who had then went on to successfully work through their phobias with Mike. All of the testimonials were saying the same thing. 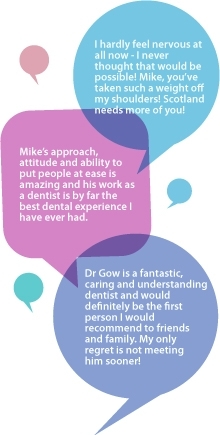 “Mike was patient, understanding, gentle at giving treatment but most importantly that the treatment was pain free”. I decided to take Mike’s number at the “Berkeley clinic” and after a few weeks managed to pluck up the courage to phone and arrange a consultation. The day of the consultation arrived and I was very nervous, in fact I had been a nervous wreck for a couple of days. When I turned up at the clinic Mike came out and met me and took me through into the consultation room. My first impression was it wasn’t as scary as I had imagined and what also made it easier was the fact that I didn’t even need to sit on the dreaded chair. Mike took time to listen to all of my issues before ensuring me that the profession had changed from how it was when I was younger. Mikes reassurances and patience made me feel so at ease that I felt able to sit in the chair, have him look around my mouth and even do an Xray all within the first visit. At the end of the session I was relieved that I didn’t need as much work done as I had imagined. My first treatment session was scheduled and Mike would treat me under sedation during a two-hour session. Mike planned to get through as much work as possible during this session. A week before the appointment I started getting very nervous and anxious. My mind was in overdrive visualising sitting in the dentist chair having treatment and this gave me heart palpitations. When the day eventually arrived I made my way into the surgery. On entering the treatment room Mike instantly made me feel relaxed and at ease and also explained again exactly what would be happening during the procedure. I was also made aware that I was in control of the treatment and could stop for a break at any time or to request more anaesthetic. This made me feel very empowered. The session went well even though there were complications taking my two teeth out, which led to the fillings having to get rescheduled for other sessions. When Mike said that Modern dentistry is pain free he wasn’t kidding. I never felt a thing; I didn’t even notice him putting in the Intravenous sedation. The injections in my mouth were also carried out very slowly and gently and were completely pain free. During the treatment the sedation worked very well, even though I was completely conscious, I was totally relaxed, at ease and happy for Mike to give me treatment. At the end of the first session I was a little disappointed that due to complication I hadn’t got through as much treatment as I planned, however I was amazed at how easy and pain free the treatment had been and I couldn’t believe that I had went through so many years of worry and depression over what turned out to be something so easy. The remainder of my treatment was for tooth fillings and some cosmetic work. Because I found the first treatment so easy I decided to do the rest of the treatment under local anaesthetic and without sedation. My treatment was broken down into manageable appointments and I’m now at the end of my treatment. Every single appointment has been a positive experience, I have never had any painful experiences, Before Mike carries out any procedure he will explain exactly what the procedure will entail. As a patient I have felt totally empowered whilst in the dentist chair. I do still get a little nervous before appointments, however the nerves and anxiety are nothing like as bad as what they were before treatment. Mike is amazed that I can now turn up and jump straight in the chair and I feel completely at ease. The work that Mike does changes peoples lives in a very positive way. He has given me “a dental phobic for almost all of my life”, a new perception of the dental profession. Mike has successfully treated me and brought me back into using this profession. I think he could successfully treat any phobic. I can’t believe that with Mikes help and understanding and high quality of care that I have spent the last three months getting through dental treatment. It has taken me a long time to get here but thanks to Mike I have went through a life changing experience and now have the confidence to smile again. This has made a huge difference to my life. Thanks Very Much Mike. I have had a busy week so I am just getting a chance now to thank you for everything since my first visit to you a few weeks ago. Only a few weeks ago, even the thought of walking into a Dentists or saying the word sent all sorts of fears through me. I was totally uncomfortable in any conversations about teeth, dentist etc, and I could not bear to look at my own mouth. It sounds so irrational but it was (and still is to an extent) a huge area of fear and embarrassment for me. I don't really know where I plucked the courage from to come along on the first day but I am glad that I did so. Considering the fact that I struggled to look in my own mouth, I was really uptight about letting someone else see my teeth, and I knew that simply even talking about it was going to be difficult. But thankfully, after meeting you I began to feel a little bit more at ease, I realised that you were very genuine. For me having someone who can understand where I am coming from and who will take the time to explain things is very important. I like to know what is going on and be fully aware of everything, I began to realise things could be like that and I started to feel a bit more comfortable that I could ask questions. I think I portrayed the idea that for me knowing what is going on and having control of it is important. I don't think many people understand and appreciate what it is like to be afraid of something, that, for the majority of the population is normal. In the past I have put up with terrible pain from my teeth but I preferred to suffer in silence as I simply couldn't bear speaking to anyone about it. Even my closest friends and family had no idea how I was feeling. I am glad we did the sedation and the extractions. It was no-where near as bad as I had imagined. I actually remember quite a bit of it, and in some respects I am glad that I do! My only foggy moment is how you managed to get me to open my mouth in the first instance. As you know this was a huge issue for me, and in many ways it still is. It wasn't so bad afterwards, a little bit sore but certainly nowhere near as bad as some of the toothaches I have had. I counted up a few days ago, and it has been 13 years since I was at a dentist, and in all honesty there have been times in the last few years were I resigned myself to the fact that I would never go. You asked me before the sedation if I trusted you, well I have never before told someone that I trusted them, but I didn't feel fully comfortable with the procedure until I actually realised that yes I did trust you to do it. That was quite an important point for me. I feel that I have taken a huge step in the right direction, there is still more work needed, but I definitely feel a bit better about it although I still coundn't bear to let anyone look in my mouth except you. You have really helped me to come a long way, in a short space of time! And, I now feel more confident that my goal of having a healthy mouth is now a lot more achievable than it was a few months ago. Thanks again for your patience, help and understanding. It was a thoughtful gesture to call the on the evening I had the sedation, and it was very much appreciated. Also cheers for being able to see me early in the morning to fix my filling. You have made a huge difference. I hadn’t been to the dentist for nearly 10 years and was in desperate need of treatment. It wasn’t really a problem for the first 4 or 5 years however, the last few years this fear had been really getting me down and it was starting to affect my life, especially over the past year. About 3 years ago one of my pre-molars had broken and I just assured myself that I would make an appointment to see the dentist ‘soon’ but at the same time knew I just couldn’t bring myself to do this. Looking back now it was like I was trapped in this fear and was embarrassed about my teeth and couldn’t possibly let a dentist look in my mouth but knew I needed treatment and it was inevitable that one day I would have to. However, taking that first step to even make an appointment just seemed impossible to me and there was no way I could do it without help. I began searching websites for information about dental phobias and found a wealth of information, however, a number of the websites just gave helpful tips on how to make an appointment and deal with any fear but I felt I really needed something more than this. I then came across a website called WhatFear.Com by Mike Gow, a Dentist who practices hypnotherapy for patients with dental phobias who had helped a number of people. I then decided that I had to contact Mike and that he would be able to help me overcome my fear. It took me a while to pluck up the courage to do this but eventually I did. I contacted Mike and just talking to him initially on the phone was so much easier than I had first anticipated. He arranged for me to meet him and just have a chat about my fears and what he could do to help. There was no pressure at all to look at my teeth and he made me feel at ease straightaway and I found him very approachable. I couldn’t believe I was so calm talking to a dentist! Before this even the mention of the word ‘dentist’ would send me into a panic. At my second visit I had hypnotherapy which was unbelievable and helped enormously. The session was recorded and I then listened to the CD the night before each appointment. I was also taught techniques which helped me to relax when I felt over-anxious. By the 3rd visit I felt ready to have treatment and throughout this Mike assured me that if at any time I felt uneasy or scared to let him know and he would stop immediately, but I’m glad to say this never happened and after this each time became easier. I still get anxious before an appointment but probably no more than the average person now. I have now had all the treatment in the original treatment plan and have even booked an appointment for my 6 months check-up! I still can’t believe I’ve done it and this time last year if I thought by now I’d have been to the dentist and had all the necessary treatment I just wouldn’t have believed it at all. I can honestly say it’s been so much easier than I thought it would be and it really is all down to Mike with his sympathetic, understanding and friendly approach. He has been more supportive than I could have ever imagined in helping me overcome this phobia. For years I was terrified of going to the dentist and it got so bad that I stopped going altogether. This resulted in my teeth getting in a terrible state over a number of years, and I knew I would have to do something about it eventually. I had a lot of roots left, where the teeth had been and was always thinking people would notice this when I spoke or smiled. No matter who you spoke to it seemed no one except me had a problem going to the dentist and this is made me feel even worse about myself. Eventually I read about a dentist who used hypnotism as part of the treatment and after plucking up courage to phone I enquired about this. I met Mike Gow and he listened to me about my fears, nervousness and feelings. He made me feel relaxed and also made me feel I was not alone about this. He took his time with me and made a plan up to treat through hypnotism and sedation which helped me greatly. Even leading up to the appointments the sessions with him seemed to have calmed me down and I didn’t really think about them, something I never thought possible. Over a period of time I had all the work done and now I’m able to smile or speak without being embarrassed about people looking at my mouth. I honestly thought I would never have been able to do this but feel so much more confident now thanks to Mike. Just wanted to say thanks for helping me get over my fear- and in such a short space of time too! I never realised how much time I spent worrying about the dentist until now that the worry is not there anymore. My anxiety levels have dropped below what I could ever imagine before and during the visit. I hardly feel nervous at all now - I never thought that would be possible! I don’t feel trapped in the chair anymore- knowing what is happening at each step really helps. The gas also has helped me break the cycle of worry. I go out having fairly ‘happy’ throughout the procedure and so I’ll return next time with that same positive memory. You’ve taken such a weight off my shoulders! Scotland needs more of you! I was recently in for the 4 teeth extractions which I had done on Thursday. I just wanted to thank you for your wonderful help throughout the procedure. Although I wouldn't classify myself as a dental phobic, I definitely had worries about those extractions and was at the point of denying any treatment to my teeth because of those worries. This would have obviously had adverse effects on my dental health. So it was with a bit of apprehension I found myself having agreed to an appointment for the extractions. However I found that your friendly, helpful and casual manner really helped me relax, and it wasn't just the laughing gas that made me feel at ease! I was a bit embarrassed at trying to talk afterwards, but you probably are used to hearing patients trying to speak with numbed mouths, plus you did seem to understand and were still really friendly despite my unintelligible mumbling :) So thank you again, and I'll definitely recommend you to anyone else I know that might feel like I did. Cheers for the best dental visit I've had! - A teenager needing teeth extracted prior to having braces.